Marine 31 Vinyl Protectant with SunBlock 128 oz. The Marine 31 Vinyl Cleaner & Protectant Kit contains everything you need to clean and protect your boat�s interior and exterior vinyl surfaces. From bimini tops to seat cushions, this kit includes the best marine vinyl cleaner and protectant to shield your boat�s vinyl surfaces from UV rays, salt, bird droppings, body oils and common stains. The kit includes essential items like a super-soft Horse Hair Brush and several plush microfiber towels, giving you everything you need to do the job the right way. The key to keeping your boat�s vinyl and fabric surfaces looking and performing like-new is to regularly clean and protect them. 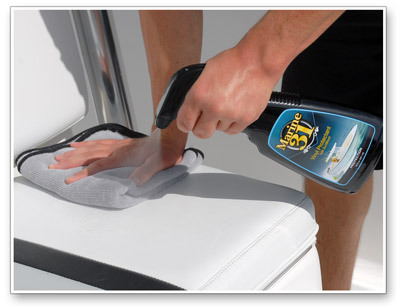 Even if you think your boat cover, seat cushion or bimini top is ready for protection, a thorough cleaning with Marine 31 Fabric & Vinyl Cleaner first will ensure all ground-in dirt and grime is removed so your protectant of choice will properly bond to the surface. Simply put, the cleaner the surface, the better your fabric or vinyl protectant will work to repel UV rays. Marine 31 Fabric & Vinyl Cleaner is a concentrated marine cleaner that gently removes ground-in dirt, soiling, staining and light mildew from all marine fabric and vinyl surfaces. Marine 31 Fabric & Vinyl Cleaner features an environmentally-friendly formula that is non-toxic and biodegradable. Marine 31 Fabric & Vinyl Cleaner can safely be used to clean bimini tops, marine cushions, inflatable boats, seats, boat covers, sail covers and deck awnings. The Natural Horse Hair Brush is packed with thousands of genuine horse hair bristles that gently clean vinyl and fabric surfaces. The soft bristles loosen soil for more effective cleaning. 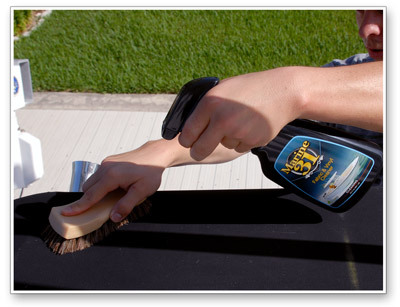 Give your boat�s fabric and vinyl surfaces the best care with the Natural Horse Hair Brush! These versatile microfiber towels are great for any variety of detailing tasks, from general washing and scrubbing off road contaminants, to applying and buffing off wax and all-in-one protectants. Detailing cloths boast an 80/20 polyester/polyamide blend in a special �feather� weave that increases their absorption properties, guaranteeing high performance and durability. A total retail value of $57.95. You save $17.96! It cleaned nasty mold from a seat that got left on the floor all winter. It cleaned dirt and oil from the seats after major engine work. Will buy as a gift for friends and family.